The Neighborhood Connectivity Survey is currently one of the main projects in Friendly Cities Lab. By sending out surveys in both paper and online forms, we are interested in studying social connectivity, patterns of communications and movements, and social capitals. This project started in summer 2017 and recently has got some positive feedback from the neighborhoods in State College and nearby cities. As moving to the next step, we recently sent out 10,000 surveys to Akron, Ohio. Every other week, we receive almost 100 surveys back. In order to accelerate the progress of this exciting project, we hope that students can help us with entering data, cleaning preliminary data, and even doing some data analysis. Python is also preferred but is not required. This project will require 45 hours of work over the course of the semester, and the successful applicant may earn 1 credit for the fall term. Additional credits may be possible. I am looking for a motivated undergraduate who is fluent in Hindi who is interested in transcribing (in Hindi) and possibly translating (into English) interviews. I have personally conducted the interviews in Hindi, but do not have the time to transcribe and translate them all myself. I may also request other documents to be translated. Other tasks may arise over the course of the semester, including making maps, reviewing documents/academic literature, etc. This project will require 45-135 hours of work over the course of the semester, and the successful applicant may earn 1-3 credits for the semester. I am looking for a motivated undergraduate who is interested in learning about organic agriculture, the global food system, and social movements concerning sustainable farming and rural livelihoods. The UROC student would be listening to interviews and talks (in English) given by Dr. Vandana Shiva and other prominent environmental activists and transcribing them. This project includes a literature review and document analysis. The literature review will consist of research on national security and terrorism in relation to refugee resettlement in the United States. Post-9/11, refugees, particularly Muslim refugees, have increasingly been framed as national security threats in relation to the “War on Terror.” I am interested in whether and how the language of national security and terrorism has been woven into refugee policy post-9/11 and how this impacts refugee resettlement in various destinations in the United States. Collection and analysis of government documents and policies will be an integral aspect of this project. This literature review and document analysis will contribute to a research proposal to be completed in Fall 2018. Work products due at the end of the semester will include an Excel spreadsheet and an accompanying Word document with short summaries of relevant academic articles and government documents (approximately 30-40 expected), and a 2 page summary of the research findings and gaps in the existing literature. Candidates should have an interest in human geography, particularly the political dimensions of the field. Students should possess quality writing and organizational skills. Ideally, candidates should have completed GEOG 020, and ENGL 15 (or equivalent), with a grade of B or higher. This project will be well-suited for students interested in issues of refugees, migration, and national security. This project will require 45-90 hours of work over the course of the semester, and the successful applicant may earn 1-2 credits for the semester. This UROC opportunity supports the development of a dissertation proposal by analyzing land cover via remote sensing of a dryland agricultural region in Colombia, populated by smallholder farmers, both campesinxs (peasants) and indigenous. An large-scale irrigation district was recently established in the highly arid zone and is already shifting human-environment relationships. Community leaders report investors’ land grabbing for intensive rice production, influencing livelihoods and land tenure. In an area valued for its agrobiodiversity and seeds adapted to extreme drought conditions, changes in moisture may also influence informal seed exchange networks. The UROC project would specifically be looking to characterize the landscape and field structure within the irrigation district. The UROC solicitation also requests a map of the irrigation district’s watershed. 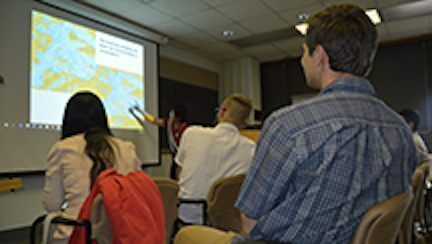 UROC student will work with graduate student on designing various maps of the watershed for use in proposals, grant applications, and eventual published articles. My work is in human-environment geography, with additional interests in critical geopolitics and feminist theory. I have a deep interest in areas marked by smallholder farmer production, sustainable agriculture, and informal seed systems. The successful candidate will be able to use remote sensing applications to find images for the research site, adjusting for decided scale; characterize field size and land cover in identified watershed. The candidate will also be able to create maps of the area and map of watershed to be used in future proposals, grants and articles. Completion of GEOG 361 and 362 with grades of B+ or higher is required. Completion of GEOG 363 with grade of B+ or higher is desired but not necessary. Must be able to work independently, problem solve, communicate progress, and think creatively about area and project. Building on a previous project, the student will take historical research on Ugandan agricultural extension, prepared last semester, and convert it into a digital timeline that is accessible online. At the same time, this project will delve into the literature on development and the state within geography pulling out key themes relevant to the Ugandan context, particularly referencing the history of agricultural development. The student will prepare a literature review of these key texts and make connections to Ugandan history through linking their findings to the digital timeline. Candidates should be well organized and attentive to detail. Experience with archival research preferred, but not mandatory. Must have completed ENGL 15 or equivalent as well as either GEOG 20 or GEOG 30 with a grade of B or higher.